E! Style's tweet - "#BTS put the GLAM in glambot on the #GRAMMYs red carpet. 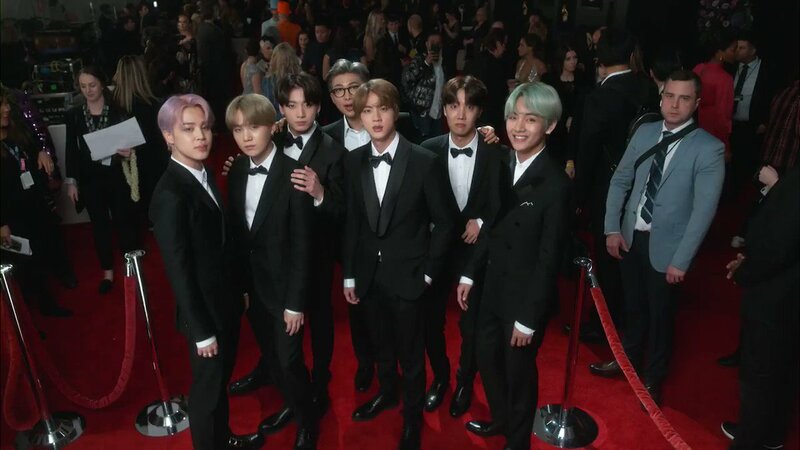 #tearitupbts "
"#BTS poniendo el GLAM en glambot en la alfombra roja de los #Grammys"
YES!!! This is what I woke up for tbh. Did Jin just hadouken me????? Im going to bed!!!!!!! PRISCILA ARE YOU READY TO GET HYPED UP? The most FINEST men out there, 11/10 would recommend. Los amo los amo los amo los amo los amo los amo los amo los amo los amo los amo los amo!!!!!! TAE SHOWIN OFF THAT FATTIE! The boys can get it. Also V can star in the next James Bond movie as the lead. Also Jin can star in Dragon Ball Z.
Ok we get it, they’re not letting us breath today.